I have been doing science since I was about 20 years old…so for 44 years. I love it. I teach undergraduate and graduate classes, and do basic research funded by the federal government. For 27 years, and counting, I have published about 40 papers on various aspects of biological sciences. There are a few things to be said: First, I did not understand the basis of my addiction to science until relatively recently….and it’s simple….the draw of Discovery is magnetic! Second, I have been interested in everything I have worked on…because it all has to do with Discovery. I have discovered 5 or 6 things, one big (leading to Noble Prize for my mentor), one small (my first discovery, made in Sardinia, Italy! ), and they all had the same experience for me. Buzzzz! Third, now I study chromosomes, those elements in a cell that contains information, the blueprint, for how a cell comes into existence and functions. We study how chromosomes change by error! Think of a chromosome like a shoestring, with two ends. The ends are called telomeres, they shorten with life, and when they shorten, errors occur frequently, leading to altered shoestrings, thus altered blue print of information for the cell. We study chromosomes in brewers yeast….a yeast cell is to human cells sort of like a VW bug to a Mercedes Benz. The basics are the same, lots of part are interchangeable (steering wheels, axles), but the Mercedes has a lot more cool stuff. 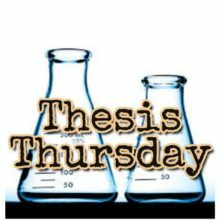 The University of Arizona’s Undergraduate Biology Research Program is partnering with KXCI 91.3 to produce “Thesis Thursday,” a weekly segment featuring student researchers talking about their undergraduate thesis projects, or research projects while working with University professors. Students describe their research, their overall goals and career interests and where they think their research will lead. They also get a chance to share their music and interests that motivate them. Broadcast three times every Thursday with a new student each week. Created by Cathy Rivers, produced by Bridgitte Thum.